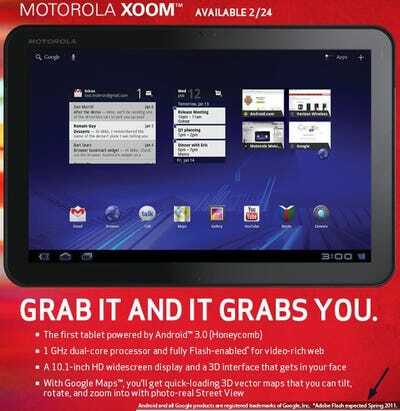 When Motorola’s big Android tablet, the Xoom, launches this Thursday it will be missing one of its key selling points against an iPad.According to a Verizon ad picked up at Engadget, the Xoom won’t have Flash support until the spring of 2011. Apple famously refuses to support Flash for mobile devices, saying it’s a dying technology and a drain on battery. However, much of the web’s video, ads, and crappy restaurant sites run on Flash. So, iPad users miss out on all that stuff. But, we’ve used a Galaxy Tab with Flash support. It’s terrible trying to watch videos on the Tab in comparison to the iPad with HTML5 support. So, maybe, Xoom users should see this as a blessing in disguise. Beyond that, this is just embarrassing for Adobe. It’s always on stage for all the big Android events. Why can’t it have its product ready to ship on time?